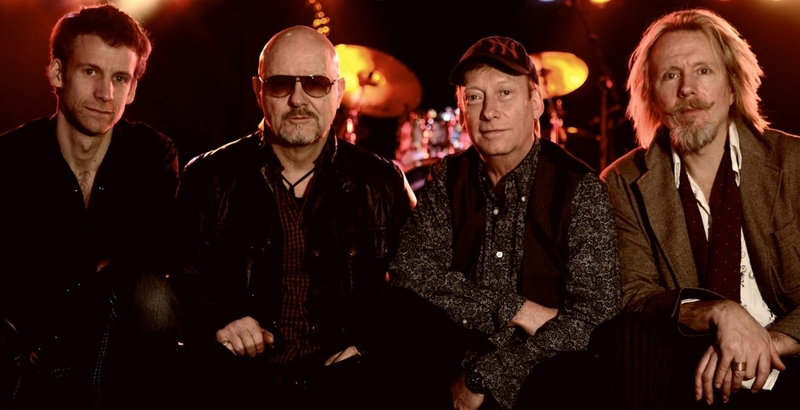 UK classic rock legends Wishbone Ash US Tour begins April 10, 2019! In the ramp-up to Wishbone Ash’s 50th anniversary, the band is celebrating its 49th year in characteristic fashion: with an extended tour. Dubbed XLIX (49 in Roman numerals), the tour began in October 2018 in the UK, followed by early-2019 dates in Europe and Japan. This spring, XLIX arrives on these shores. Longtime fans and new converts alike will revel in the group’s signature twin-guitar mastery and powerhouse rhythm section as they present classics spanning their career. The US leg of the XLIX Tour will revisit some of the band’s favorite venues as well as new ones from the Eastern seaboard to the Rocky Mountains. Formed in 1969 in London, England, Wishbone Ash is one of the most influential guitar bands in the history of rock. True road warriors, each year they log around 30,000 miles, roughly equivalent to circumnavigating the earth. Mark Abrahams, the group’s newest member, has been trading licks with Powell for two years. Right out of the gate, Abrahams earned rave reviews from critics and fans on both sides of the Atlantic. Longtime rhythm section Bob Skeat on bass and Joe Crabtree on drums continue to provide the solid groove that is their hallmark. By 1969, The Beatles, the blues boom and psychedelia had made their impact on classic rock, and the creative possibilities were infinite. Pioneering the use of twin lead guitars, Wishbone Ash jumped on board the burgeoning progressive rock scene. Taking full advantage of the fertile musical environment, they produced a distinctive brand of melodic rock. Inspired equally by British folk traditions, American jazz and R&B, the group played to public and critical acclaim. Power and melody have made the Ash a hard act to follow, while they are currently being discovered by new generations of loyal rock fans. Through the years the band has delved into various musical genres, from folk, blues and jazz to pedal-to-the-metal rock and electronica. Whatever the style, Wishbone Ash’s signature is the distinctive twin-melodic lead guitar interplay that has influenced such bands as Thin Lizzy, Lynyrd Skynyrd, Iron Maiden and, more recently, Opeth. The quintessential road band, Wishbone Ash has gained worldwide recognition based firmly on a regime of relentless touring. Wishbone Ash has to its credit 24 original studio recordings, 11 live albums and five live DVDs along with a DVD rockumentary (“This is Wishbone Ash”). Released April 2018, “The Vintage Years” 30-disc box set, three-and-a-half years in the making, is a special collection dedicated to the band’s output from 1970 to 1991, including all 16 studio albums, three live albums, eight previously unreleased live shows from 1973 to 1980, a 156-page coffee-table hardcover book and an assortment of memorabilia. Also available is the fifth Roadworks CD, “Live in Sacramento,” recorded on the 2018 North American tour; and the first official re-releases in decades of “Twin Barrels Burning” from 1982 and “Raw to the Bone” from 1985. In addition, some older recordings are emerging from the vaults, including Snapper Records’ most recent release, “Live in Glasgow” from 1977. The legendary and eagerly awaited “Live from Rockpalast” TV show recording from 1970s Germany will also soon be available on the label Made in Germany Music. In 2015, Powell released his musical memoir, “Eyes Wide Open: True Tales of a Wishbone Ash Warrior,” co-written with renowned Irish music journalist Colin Harper and available in Kindle and Apple iBook formats. There is no other rock band in history that has done more with the twin guitar concept than Wishbone Ash. Be sure to catch them on the XLIX US Tour in April-May 2019, and stay tuned for the 50th anniversary tour in 2020! Tour dates and more information can be found at: www.wishboneash.com. Watch Wishbone Ash’s The Vintage Years Deluxe 30CD Box Set Unboxing Video! All music has been remastered from the original multitrack and ¼ inch tapes, sourced from Martin Turner and Andy Powell’s personal collections, and from the Universal Music and Atlantic archives. Accompanying this thorough collection of repertoire is a 156-page coffee table hardback book written by Classic Rock’s Dave Ling, which includes personal photos, rare posters and flyers and collector’s memorabilia. Wishbone Ash, one of the most influential guitar bands in the history of rock, will be coming to the States in April 2018 on the Open Road Tour. True to its name, the tour will see the band clocking some serious miles as they return to America’s Southern swath, from North Carolina and Florida to California. Longtime fans and new converts alike will revel in the group’s signature twin-guitar mastery and powerhouse rhythm section as they present classics spanning their career. Wishbone Ash has to its credit 24 original studio recordings, 11 live albums and five live DVDs along with a DVD rockumentary (“This is Wishbone Ash”). Released April 2018, “The Vintage Years” 30-disc box set, three-and-a-half years in the making, is a special collection dedicated to the band’s output from 1970 to 1991, including all 16 studio albums, three live albums, eight previously unreleased live shows from 1973 to 1980, a 156-page coffee-table hardcover book and an assortment of memorabilia. Also now available are the first official re-releases in decades of “Twin Barrels Burning” from 1982 and “Raw to the Bone” from 1985, plus definitive editions with all new 2017 remasters. Wishbone Ash’s Twin Barrels Burning and Raw To The Bone Released as Official and Remastered Definitive Editions – OUT NOW! Each album is available on 2CD and Picture Disc LP with extensive bonus materials! These are the FIRST OFFICIAL re-releases of Twin Barrels Burning from 1982 and Raw to the Bone from 1985 in decades and DEFINITIVE EDITIONS with all new 2017 REMASTERS. Both albums feature new liner notes by rock journalist Dave Ling, including new interviews with all the surviving members and archive quotes from the late Trevor Bolder. Twin Barrels Burning – This smoking hot 21 TRACK 2CD set includes the American Remixes of the album on a second disc, which have NEVER BEEN ON CD BEFORE. Raw To The Bone – This mammoth 23 TRACK 2CD set has bonus tracks including a HOLY GRAIL for Wishbone Ash fans – ALL FOUR UNRELEASED SONGS from the post-album 1986 SESSIONS. The bonus CD also includes The Friday Rock Show BBC Sessions, which are often described as better than the album versions, plus four live tracks from Hammersmith. These re-issues by Cherry Red are FULLY APPROVED by Steve Upton, Laurie Wisefield, Andy Powell, Merv Spence, and the estate of Trevor Bolder. The second disc of bonus tracks accompanying each CD will not be available with any other product or box set. Wishbone Ash The Vintage Years (1970-1991) Limited Edition Deluxe 30CD Box Set Available April 2018! Authorised by all of the original band members! Wishbone Ash’s Twin Barrels Burning and Raw To The Bone Given First Official and Remastered Definitive Edition Re-release! Each album is available on 2CD and Picture Disc LP with extensive bonus materials, just in time for Christmas! These re-issues are FULLY APPROVED by Steve Upton, Laurie Wisefield, Andy Powell, Merv Spence, and the estate of Trevor Bolder. These 2CD sets and Picture Disc LPs are IN STOCK NOW with PledgeMusic orders being sent out in time for Christmas – ahead of being released by Cherry Red on 2nd February 2018. Classic Rock Legends Wishbone Ash Get “Tough & Tender” on North American Fall Tour! Wishbone Ash, one of the most influential guitar bands in the history of rock, will offer their North American fans a dynamic concert experience on the 2017 “Tough & Tender” Tour. In addition to the high-powered, all-out rockers the band is known for delivering, the guys will turn down the volume (but not the intensity) and treat audiences to acoustic versions of some of their classic hits. Formed in 1969, Wishbone Ash finds itself in rare company these days. Not many bands are still going strong after nearly 50 years. It takes a serious lifetime of commitment to the craft of making music; but, more importantly, real skill is required to navigate the shifting seas of the music industry, and few know that better than Powell. The band recently released a four-disc “Road Works” box set, a compilation of four separate shows recorded in Germany and the UK. In October 2015, Powell completed his autobiography, “Eyes Wide Open: True Tales of a Wishbone Ash Warrior,” co-written with Irish music journalist Colin Harper. The book, published by Jawbone Press, has met with public and critical acclaim. In addition to the “Tough & Tender” Tour, Fall 2017 will also see the release of a 32-CD deluxe box set, “Wishbone Ash – The Vintage Years,” on Snapper Music. There is no other rock band in history that has done more with the twin guitar concept than The Ash. Be sure to catch them on tour this September. Tour dates and more information can be found at http://www.wishboneash.com. Follow the band on Facebook @wishbone.ash.official, Twitter @wishboneash_com and Instagram. Wishbone Ash, one of the most influential guitar bands in the history of rock, bring it to their North American fans on the 2016 “Take It Back” Tour. As they celebrate their 47th anniversary at shows from Denver, CO, to New York City, the guys will present time-honored classics and deep tracks from the back catalog, as well as material from recent recordings. Wishbone Ash is led by Powell on guitar and vocals, trading licks with Finnish guitar master Muddy Manninen. Bassist Bob Skeat, an 19-year veteran of the band, sets the pace with Joe Crabtree, one of the best of Britain’s new breed of drummers, himself an 8-year Ash veteran who also handles a lot of the band’s tech requirements. True road warriors, each year the band logs around 30,000 miles, roughly equivalent to circumnavigating the earth. The fruitful results of near-constant touring are evident on the latest DVD release, “Live in Paris,” recorded in May 2015 during a three-day residency at Le Triton Theatre in Les Lilas, Paris. There is no other rock band in history that has done more with the twin guitar concept than The Ash. Be sure to catch them on the Take It Back Tour this September. Tour dates and more information can be found at http://www.wishboneash.com. 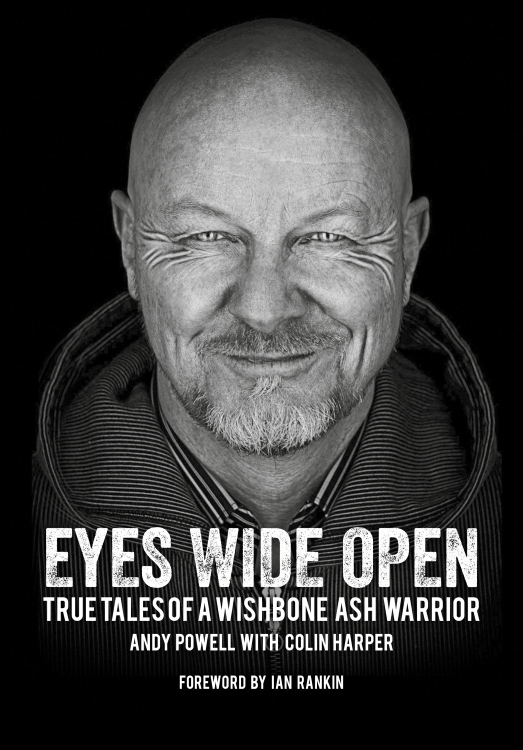 New Autobiography by Wishbone Ash Guitarist Andy Powell “Eyes Wide Open: True Tales Of A Wishbone Ash Warrior” Now Available! London, UK – In 1969, Andy Powell was one of four founding members of progressive rock pioneers Wishbone Ash. Forty-six years later, with no sabbaticals, he is still a member of Wishbone Ash. And he’s seen a lot of interesting things along the way. Watching the birth of rock ‘n’ roll in the 50’s; stepping into the swinging 60’s mod scene as a teenager; touring the States with The Who; selling hundreds of thousands of copies of Argus; being managed by industry legend Miles Copeland; outliving punk and moving to America; battling former bandmates over the right to use the name Wishbone Ash, and fighting to keep that name alive through changing tastes and styles—Andy Powell has been there, done it, and seen it all. And he’s still doing it today. Honest, unpretentious, and often wryly amusing, Eyes Wide Open is not just the story of one man’s adventures in music but also a journey through some of the most thrilling years of rock history. Andy Powell is a songwriter and guitarist best known as the founding and sole remaining original member of Wishbone Ash. Born in Stepney, London, in 1950, he now lives in the USA with Pauline, his wife of forty-plus years. Colin Harper is the author of Dazzling Stranger: Bert Jansch And The British Folk And Blues Revival (2000), Bathed In Lightning: John McLaughlin, The 60s, And The Emerald Beyond (2014), and The Wheels Of The World: 300 Years Of Irish Uilleann Pipers (2015). There is no other rock band in history that has done more with the twin guitar concept than The Ash. Be sure to catch them on the Road Warriors Tour this September. Tour dates and more information can be found at http://www.wishboneash.com.